I've said it before and I'll say it again; Wes Anderson is my favorite director. That's actually partially a quote from Ferris Bueller, which is one of my favorite films but isn't directed by Wes Anderson, but whatever. The point is, my website is called Archer Avenue for a reason and that reason is The Royal Tenenbaums and that movie is an Anderson masterpiece. Bottle Rocket, Rushmore, Tenenbaums, Life Aquatic, Darjeeling Limited, Fantastic Mr. Fox, Moonrise Kingdom, Grand Budapest; his filmography is a thing of pink, over-dramatic, ultra-stylized beauty, though not every single film can be called spectacular. I like some more than others, but he's top-level director regardless, a unique mind making original content in a way that deserves our respect. 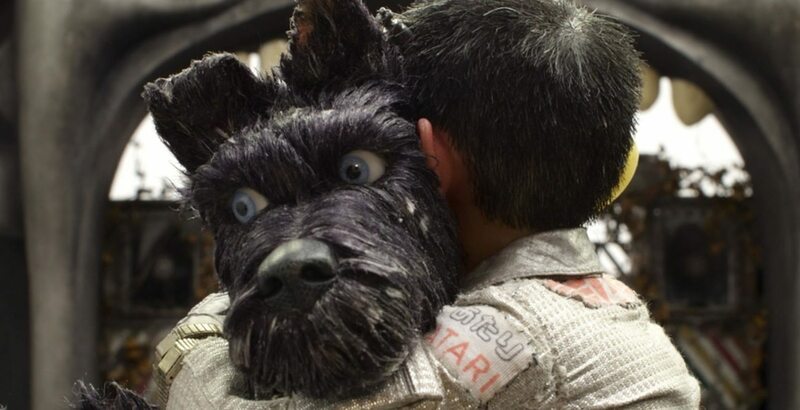 Isle of Dogs is Anderson's second attempt at animation, and I'm assuming it won't be last, but unfortunately it also isn't his best. In Japan in the near future, a dog crisis will shake the island nation, causing the country to divide over the love of their faithful pets and the health of their very own families. Dog Flu, Snout Fever, rampant reproduction; something must be done, and one man has the solution. Mayor Kobayashi wants to ship every dog to Trash Island, a wasteland where nobody goes and where man's ex-best friend can live in squalor. Professor Watanabe is against this idea, knows that he can find a cure, but is buried beneath a wave of public fear and the overwhelming power of the Kobayashi family. So, every dog is exiled, including the guard/friend of Kobayashi's own ward/distant nephew, a loving boy named Atari. He steals a plane, flies to Trash Island, crashes among the heaps, all to find his companion, a dog named Spots who stole he heart and who won't be left to die alone. Did I mention that I love Wes Anderson? His flare for comedy, color, and complete originality knows no equal; the man is a genius. I know his films aren't for everyone, and that they can come across as overly artistic, but I dig his style, and he creates movies the way that they were meant to be created; with passion and with singular vision. He isn't an expert in animation, but he simply brings his lens to the medium and does things his way, the result being something you've never experienced before. It's all stop-motion, which is incredibly impressive, how each dog hair can move independently, the time it must have taken to get it all just right. Anderson breathes wacky life into each character, making them pieces on his very own, nonsensical board game, moving them about as if they were players on a stage until the result matches whatever wild, dream-like image he currently has conjured up. That's just Anderson's vibe, that's what he does, and he brings is to Isle of Dogs as he would to any other movie. He also brings his giant cast of impressive actors and actresses, until you wonder; are these people just here to have fun, are they all friends, is this something other than a typical job? Cranston, Norton, Bob Balaban, Bill Murray, Jeff Goldblum, Greta Gerwig, Frances McDormand, Scarlett Johannson, Harvey Keitel, F. Murray Abraham, Yoko Ono, Tilda Swinton, Ken Watanabe, Fisher Stevens, Liev Schreiber; wow. The film has the pizzazz, the actors, the story, the heart; it's surprisingly accessible to a large audience, given the specific oddity of its creator. But all the same, I didn't adore it, and I think I know why. First, Fantastic Mr. Fox is better, more entertaining, less worked over. Second, the details of the plot are insane, with flashbacks everywhere, tiny nuggets of info flying at you around every corner, barely enough time available before the credits for you to assimilate everything you're supposed to know and feel. And third, the movie simply felt like a showcase of what was possible, what was inside a brilliant man's head, not necessarily a sharing of something that we needed to see. 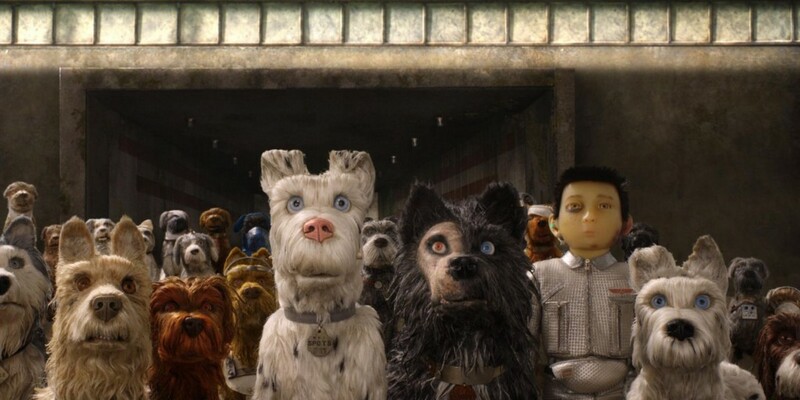 I liked Isle of Dogs because I'm always up for kooky and for crafty, but I don't feel like it was Anderson's best work; he constantly walks the line between entertainment and self-indulgence, and I think perhaps, this time, a toe came down on the wrong side. Order "Isle of Dogs" now!